I'm probably talking off the top of my head here but I saw a Murder She Wrote episode, the other day which I had never seen before. Now that I have the Hallmark Channel again, I find my self watching it for a couple of shows that I never got to see before since the Western channel is in 100% reruns at the present time. Anyway, this episode was about a man whose partner had set him up as a murderer and spent 30 years in prison, but his wife asked Jessica to check into the details of the trial. The unusual thing was that it starred Martha Scott ( I didn't get who the husband was however), and several times the screen went to black and white to recreate the original setup. Obviously this was taken from a movie Ms. Scott made during her younger years and scenes were taken from it and encapsuled into this episode making it quite interesting to watch. Instead of young actors who resembled Martha and her screen husband, the actual people were there, albeit in black and white. I don't know if this has been done before, but it made for a rare experience. BTW, is anybody out there?????????????? I am. I've seen shows where they go back in their own history but not like you describe. The closest thing I can think of is in THE SHOOTIST when they show John Wayne clips from earlier movies. It looks like husband was Jeffrey Lynn. On the show Boston Legal they used old clips of William Shatner from a 50s show he was on for a flashback scene. It 's a pretty clever idea. 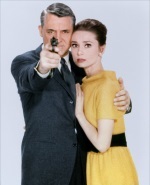 The film TARGETS shows clips from Boris Karloff films "The Terror" and "The Criminal Code". MADHOUSE shows clips from some of Vincent Price's earlier AIP films.